As an integral component of plant cells, insoluble fiber is one of the oldest nutritive and structural components. Insoluble fiber is a component of dietary fiber, consisting of water insoluble, metabolically inert components. For this reason, insoluble fiber is often known as a bulking agent, aiding in the digestive process while providing health benefits related to reducing serum lipid levels. Insoluble fiber is not a source of calories. 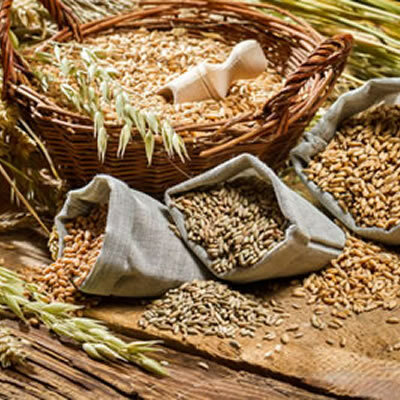 Insoluble fiber is best defined as the organic fraction of the diet that is indigestible or slowly digesting and occupies space in the gastrointestinal tract.1 Additionally, insoluble fiber is defined as a mixture of chemically complex polysaccharides which cannot be digested by the small intestine. Resistant starch is considered an insoluble fiber. As an integral component of plant cells, insoluble fiber is one of the oldest nutritive and structural components on Earth. For instance, cellulose is a form of insoluble fiber. Additionally, chitin, a component of fungi, insects and crustaceans, is a form of insoluble fiber. Xanthan gum, a popular stabilizer in food processing and fine dining restaurants, is a form as well. Commonly, grains are milled and defatted, followed by a process to remove the water insoluble portion of the flour. Since insoluble fiber is not easily dispersed in water, extraction methods remain rather straightforward. Since insoluble fibers cannot be directly digested, they have no real nutritive value to the body. However, as a non-digestible material, insoluble fiber provides bulk as semi-digested foods move through the body. For this reason, insoluble fiber is exceptionally beneficial to the human frame. As an integral part of the human diet, there are very little dangers involved in consuming insoluble fiber in reasonable quantities. Insoluble fiber is GRAS. Depending on the type of insoluble fiber, care might be required in regards to labeling requirements. For instance, Xanthan gum is commonly labeled as E415, a formal food additive. Additionally, cellulose is commonly labelled as E460. Consult the FDA Code of Federal Regulations (CFR) for specific labeling requirements. Mertens, DR. “Challenges in Measuring Insoluble Dietary Fiber.” Journal of Animal Science. 2003. 81:3233-3249. DeVries, J. W., L. Prosky, B. Li, and S. Cho. “A Historical Perspective on Defining Dietary Fiber.” Cereal Foods World (1999): 367-69. Banqoura M, Ming Z, Nsor-Atindana J, Xue Z, Tolno M, Wei P. “Extraction and Fractination of Insoluble Fibers from Foxtail Millet (Setaria italic).” American Journal of Food Technology. 2011. 6(12): 1034-1044. Anderson J, Smith B, Gustafson, N. “Health Benefits and Practical Aspects of High-Fiber Diets.” American Journal of Clinical Nutrition. 1994;59(suppl):1242s-7s. “Dietary Fiber.” Accessdata. Fda. Gov. Food and Drug Administration, 6 June 2016.